The Fair Trade movement (FT) started in 1964 within the framework of the United Nations Conference on Trade and Development (UNCTAD). Since then a number of European countries promoted the UNCTAD stores, selling products from developing countries. Then the “solidarity store” chain got started. In 1973 FT coffee began with coffee from Guatemalan cooperatives under the brand “Indio Solidarity Coffee.” In the decade of the 1980s the volume of products increased, as well as their quality and design; the solidarity stores sold blended coffee, tea, honey, sugar, cocoa, nuts, bananas, flowers…In 1988 “Fair Trade Labelling” began in Holland, and in 1997 the International Fair Trade Organization was formed – FLO for its acronym in English. Since 2012 decisions in FLO are made with 50% of the votes of organizations from three continents (Latin American Coordinator of Fair Trade from Small Producers, Fair Trade Africa and the Network of Asian Producers) that represent 800 organizations and 1 million small producers from 60 countries in Africa, Asia and Latin America, and the remaining 50% of the votes from 21 national brands. What has happened with this large FT movement? Here, focused on coffee for didactic reasons, we present its innovative character, its later deterioration, and a path to reinvent itself. 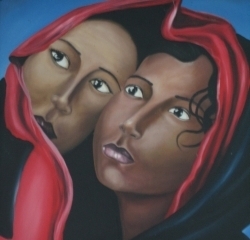 The biggest obstacle for getting out of poverty is the intermediation network that combines usury, low prices and deception in the weighing and quality control of the product, and the lack of organization of the producers. FT responds to this challenge with three elements (see Figure 1). 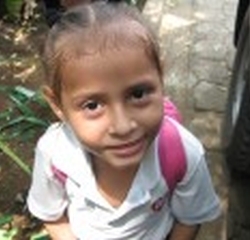 First, the member families receive credit through their first and second tier cooperatives, capital that comes from the social banking sector (9% interest rate), and from FT organizations. A good part of them pre-finance 50% of the value of the product at 0% interest, so that the producers can avoid usury and ensure product. Secondly, FT sets a minimum price of US$1.40/lb when the international prices are less than $1.40/lb, provides an additional bonus of US$0.20/lb above the market price, and for organic coffee a premium of US$0.30/lb. 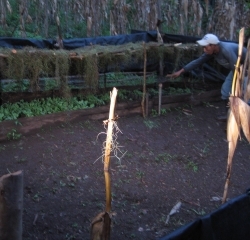 Thirdly, compliance with the agreements and policies for organic coffee is assured by the certifiers: FLO does it for the bonus and good operations within the cooperatives, in both cases in situ, erecting long term relationships. This combination of commerce, financing and multinational organization of counterparts leads to the families improving their production, their lives in the family and in the community, with the FT network being a space for learning and social, economic and environmental transformation. After a half century of FT, what has happened? First, the prices to the producer in terms of the final value of coffee in the decade of the 1930s was 33% (Wickizer, 1943, The world coffee economy), 27% in the decade of the 1970s (Clairmonte and Cavanagh, 1988, Merchants of Drink), 15-20% in the decade of the 1990s (Pelupessy, 1999, Coffee in Cote d’Dvoire and Costa Rica), 10% in 2001 (Mendoza y Bastiaensen, 2002, Fair trade and the coffee crisis in the Nicaraguan Segovias) and 12% in 2009 (Mendoza, 2012, Gatekeeping and the struggle over development in the Nicaraguan Segovias); in other words, it went from 33 to 12% over 8 decades. When we compare both chains, the prices to the producer in relative terms (%) is smaller in the FT chain than in the traditional chain, even though in absolute terms it is a little bigger; in other words, the FT coffee price to the consumer is higher, while its distribution through the chain is similar to the traditional chain. Secondly, credit gets to the member families in an unequal manner, some get nothing, no one gets it at an interest rate of 0%, others get some amount at interest rates between 12-18%. Third, the FT bonus gets to the families in an unequal manner, some get nothing, others get US$0.5/lb and others get a little more. 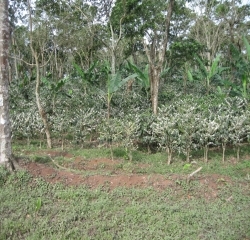 Fourth, the complaint is that the yield (humidity and quality of the coffee) is worse than in the traditional buyers. Fifth, it is estimated that 30% of the total coffee that the members produce is sold through FT, while the export cooperatives are increasingly buying coffee from “third parties” (not members of the cooperative) who come in through the traditional commercialization network. From here, the challenge of ending usury, accessing markets and doing it through a multinational alliance is being rolled back. The first two elements of FT were weakened, and the third is controlled by elites in the FT chain, attracted in turn by the logic of the market. FLO audits, and analysis of the social banking sector and verifications of the organic certifiers are reduced to formal elements (review of financial data, minute books and written records); in some cases without understanding that the social structures absorbed the FT chain, in other cases understanding these structures, but blocked from reporting and taking measures out of fear of financial losses, and in general keeping quiet when facts like the pre-financing that comes from the stores of Europe or the loans from the social banking sector do not get to the producers, yet they are the ones who have to pay them. Figure 2 expresses the concentration of power (capital, positions, information and contacts) from where the entire chain is managed, and the privatization of the FT brand. Seen from the region, the second tier cooperatives concentrated investments based on a good part of the bonuses, premiums and earnings, and are the “door” to the certifications, the banks and the markets. The Delegates of the first tier cooperatives to the second tier cooperatives, as well as their board members, are eternal. The administrative personnel run the second tier cooperatives, and many of them are named by national and international organizations as the representatives of their cooperatives in their organizations. The rotation and renovation of the leaders is vetoed, because it would affect their financial income, the control of the administrative staff of the cooperatives, and the circuit of transnational power; and if that veto conflicts with the statutes of the cooperatives, the statutes are reformed. As that power got consolidated, most of the first tier cooperatives hollowed out; they are not doing savings nor credit, some are not even collectors of coffee and their board members do not meet monthly, even though their “minutes” exist. Under these conditions these cooperatives cannot have an impact on the second tier cooperatives; if they try to, they face another wall: “FLO and the bank say that you cannot change me, because my signature is on the contracts”; if there is a change in management of someone who was a favorite of FT: “If you change the manager, we are not going to buy your coffee.” If a cooperative dares to save and manage itself: “you do not have the FT certification nor organic coffee certification and I am not going to give it to you, if you insist it will end up being very expensive financially.” If independent researchers seek information in FLO, “we only give information to the cooperative.” And, if in spite of these walls, there are first tier cooperatives that are able to get out of this power circle, their bonuses and premiums more frequently get to their members, and their credit to their members has lower interest rates. 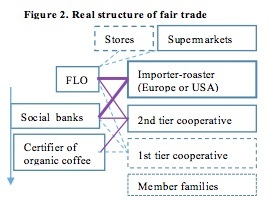 The FT chain expresses the “law of oligarchy” that Michels in 1911 found in democratic organizations, and the logic of the markets (importers, roasters and distributors increase their control over the value of coffee, and the FT staff act out of financial interests – and over wanting to earn more Fair Trade USA and FLO separated), within a framework of mutual complicity and exclusive transnational legitimation. The paradox, a movement that got started to fight traditional commerce was absorbed by that very logic, even though in the name of the poor. Clark and Doersam (2000, open space community) say that organizations are born, grow, mature, decay and die or they change. Deterioration is the death of FT. To avoid death, we argue that FT should reinvent itself, responding to the producer and consumer families, expanding and strengthening the relationships and democratizing the FT chain. First, Solidarity Stores and first tier cooperatives should construct a space for direct communication (SS-C), including the possibility that one be a member of the other; SS-C be supported from studies coming from an alliance between a development studies institute in the north and another in the south; SS-C become a space for learning about prices, credit, distribution mechanisms for the bonus and the premium, the democratization of the FT chain…; SS-C, to the extent that it learns, influences FLO so it is transparent and shares with the public its audits and reports, transparent to businesses, certifiers, banks and cooperatives, getting beyond the myth that “the enemy will take advantage of our information”. Secondly, FLO and the certifiers respond to SS-C, their audits and verifications contribute to good practices within the FT organizations: e.g. veto the permanance of board members and delegates as leaders for more than two periods in the cooperatives and international organizations, regardless of the reformed statutes and tricks of the elites; the FT seal and organic coffee certification is only for the coffee of the members. 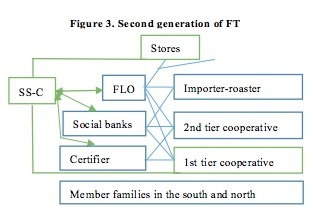 That the FT and organic certification be for first tier cooperatives, and at prices agreed upon with SS-C to prevent the first tier cooperatives from being excluded. 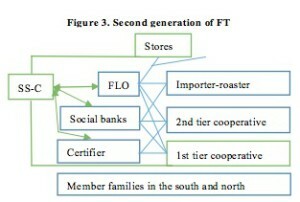 Third, that the first tier cooperatives develop savings and loan services, and decide about the use of 100% of the bonus and the premium, while the second tier cooperatives specialize in coffee processing, facilitate the connection of the first tier cooperatives to markets, and support groups of cooperatives to develop services depending on the opportunities around them and their capacities. 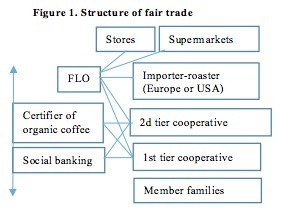 Based on these three elements, the model would be “I support you so that you might commercialize your excellent coffee”, instead of “I buy your coffee to sell it”; the producers would recover their faith and turn in 100% of their coffee to FT, and the consumers would appreciate that they are really drinking organic coffee and that the added price that they pay is working well; systematic corruption would be avoided that is impoverishing producer families; the social banking sector would recover their loans at less cost. This route could be a way of getting beyond Michels Law and building “societies with markets” instead of “market societies”, and with this the FT mechanism would really help people get out of poverty.